All eyes are on the Motorola Xoom tablet, and for good reason: It's the first device in an expected multitude to ship with Google's tablet-optimized Android 3.0 (Honeycomb). The Xoom has a lot of features to like, and a lot to set it apart from the ever-growing crowd of tablets; but it also has some drawbacks that temper my enthusiasm about it. One drawback is its price: $800 with no contract on Verizon, and $600 with a two-year contract (prices as of February 23, 2011). More critically, I experienced some issues with the display and image rendering during my hands-on evaluation of the Xoom. Using the Xoom confirmed my earlier impressions of Android 3.0: The OS is vastly superior to its predecessor and is so different to use that it's practically unrecognizable as a close relative of the Android widely deployed today. The software's tablet optimization was evident in the home screens, the widgets, the music player, the browser, the e-mail, and even the YouTube player. Missing, however, was the Adobe Flash 10.2 player, which is coming soon but wasn't available in time for this story. The Xoom zooms to the top of the tablet class in overall style and design. The build quality is solid, with volume and power buttons that are easy to press and a sturdily constructed SIM tray that doubles as the MicroSD Card slot cover. It has a soft, rubberized feel along the top, and black metal on the bottom when held in horizontal mode. It also has its buttons and other elements configured for that orientation. Clearly, the device was designed with landscape orientation in mind: In that position, you hold it with two hands, and the front-facing 2-megapixel camera sits at the top middle of the display, just as the Webcam on a laptop typically is. The stereo speakers, at back, appear to the right and left, with plenty of clearance for your fingers (this positioning is unfortunate, however, if you plan to listen to music while the pad is lying flat, with its screen face-up). The micro-USB and HDMI-mini ports are at bottom, perfect for mounting the Xoom in its optional dock (standard dock, $60, Speaker HD dock, $150). The power button is located on the back, to the left of the rear-facing, flash-equipped, 5-megapixel. The button lies where your forefinger naturally lands when you hold the Xoom in both hands. The Xoom runs Nvidia's Tegra 2 platform, with a dual-core 1GHz processor, 1GB of RAM, and 32GB of on-board user memory. The MicroSD Card slot permits users to double their storage space as they use the device--a boon for anyone who tends to pack gadgets with media. Unfortunately, the MicroSD Card slot is not enabled at launch-so early shoppers will have to wait until a software update comes along (eventually, Xoom will ship with the slot enabled). The display measures 10.1 inches diagonally, with 1280-by-800-pixel resolution. The widescreen's 16:10 aspect ratio makes it perfect for viewing video; but for folks accustomed to the 4:3 aspect ratio of the 9.7-inch Apple iPad screen, it may take some getting used to. The unit also stands an inch taller than the first-generation iPad, but it feels comfortable when you hold it landscape-style in two hands. You'll definitely want to use two hands: Like the first-generation iPad with 3G and Wi-Fi, the Xoom weighs 1.6 pounds. The weight is manageable for periods of two-handed operation, but intolerable for extended one-handed operation. A third-generation Amazon Kindle weighs one-third as much as the Xoom. I wasn't terribly impressed with the Xoom's display's quality: In spite of its high resolution, I detected graininess; colors seemed somewhat inaccurate and didn't pop as they do on the iPad and on Samsung's bright, occasionally oversaturated Galaxy Tab. Initially, the device's display looked lovely. The home screens were readable, and colors looked fine. But as I used the device, the pattern of the screen became more obvious. The display on the iPad felt downright sparkly, as if sand were buried in the liquid crystals themselves. In contrast, the Xoom seemed to present me with a grid whose lines were more obvious in some situations than in others. I noticed them especially in photos and on the gray of the keyboard, but less so on the default blue Honeycomb wallpaper. The lines were most obvious in screens with white backgrounds, such as in the Web browser or in the preinstalled Google Books app. I also detected a lot of pixelation in the letters, but that effect varied depending on the font I used (for example, the sans serif font in Google Books looked relatively smooth)--which leads me to wonder whether this is primarily a screen issue (Motorola says that the display is 150 dots per inch) or a rendering issue. When I looked at a series of pictures (10-megapixel or greater images shot on advanced cameras) sideloaded to the Xoom via the USB connection on my PC, it became clear that the images' contrast was off. Under identical lighting conditions, I compared the images as they appeared on the Xoom to the original images on my PC monitor and to the way they looked on the Samsung Galaxy Tab and on the first-generation Apple iPad. Colors seemed dull and uninspired on the Xoom, and the images lacked the detail and depth I expected to see. Even worse, the included Gallery app didn't render the images properly. Images lacked sharpness and suffered from artifacting, dithering, and macroblocking. It was almost as though I were looking at images that had undergone a preview render but never fully rendered. A Google spokesperson did not know what was going on, nor did Motorola. Nvidia, which makes the Tegra 2 processor, did not respond to my inquiry before I posted this review. Blockiness and artifacting were issues in video playback, too--for instance, in YouTube videos played in both standard and HQ modes, and in Google Talk video chat over Wi-Fi (as well as 3G). The images I captured on the device were disappointingly middle-of-the-road, as well. Overall, the camera was a bit awkward to operate, as was the video camera, though you do get more controls than before. The big piece of glass on the display is readable indoors, but it's very glarey. I've described the Apple iPad as a mirror--but compared to the mirror effect of the Xoom, the iPad is as nonreflective as paper. The Xoom's glare was noticeable both indoors and out; and closer inspection revealed an air gap between the glass and the display beneath. I expected better: If the Barnes & Noble NookColor could nail the screen and glare issue on its $250 e-reader tablet, why couldn't Motorola overcome glare on its $800 flagship device? I was quite impressed with the Xoom's overall ability to zip through content. I easily and speedily moved through menus, through large collections of digital images, and through the redesigned Android Market. Even the file transfer speeds via USB were impressive. Anyone who has synced content to an Apple iPad knows how torturously slowly content moves from PC to device. On the Xoom, waiting wasn't a huge issue: I transferred 700MB of digital pictures to the Xoom in just 3 minutes. Not too shabby. Speed buffs will also appreciate that this 3G+ Wi-FI device will be able to migrate to Verizon's 4G LTE network in the second quarter at no extra charge. The free upgrade rewards early adopters eager to own the first Honeycomb tablet. Ultimately, the price feels too high, given that the nearly one-year-old, no-contract, 3G- and Wi-Fi-enabled first-generation Apple iPad came in at $730. But by obtaining a 4G SIM card (when the update comes out) and performing a software update, you'll be able to surf the Web with the Xoom at lightning speeds. That future-proofing is a very appealing touch. Android 3.0 is easily the most polished Google software effort to date, but the random apps I downloaded from the Android Market didn't work on Honeycomb at all, let alone scale to the Xoom's large screen. Moreover, there's no obvious way of knowing whether an app has been optimized for Honeycomb. Motorola rates the Xoom's battery life at about 10 hours of high-definition video playback. And the device's recharge time is fast, at just 3.5 hours for a full recharge (in my testing, it recharged from a 13 percent charge in less than 3 hours). One of the Xoom's main assets--aside from being the first Honeycomb tablet to market--should be its deep integration with the Honeycomb platform: Motorola worked hand-in-hand with Google to make Honeycomb run well on the Xoom, Google's reference Honeycomb device. 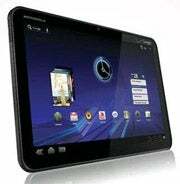 As such, the Xoom is likely to be as pure a Google Honeycomb device as possible. All in all, the device is a solid but imperfect first effort. Platform stability and 4G can come with future software upgrades, and the bugs in the graphics and video rendering will (I hope) be fixable through software, too. But the screen's annoying grid effect can't be fixed by a simple update. The Xoom is the first large-screen tablet to provide stiff competition for Apple's iPad. But as smooth as many of its elements are, and as groundbreaking as this first-of-its-kind tablet is, its weaknesses prevent me from giving it a rousing endorsement. Software rough patches can be patched; but hardware frustrations may run deeper than any firmware update can fix.